Catherine is a Mother of 4 and has 5 grandkids. She loves baseball, camping, and just spending time with her grandchildren. She loves to cook and BBQ. She’ll host all the parties at her house, spending all morning in the kitchen, cooking all the entrees, and then finish off manning the grill. 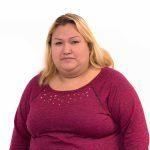 She has been in the freight industry for over 20 years and loves all the challenges and demands that come with the job.